PODCAST: I Was Broke. Now I’m Not. I do not know if you have checked out the "I Was Broke. Now I'm Not." podcast recently, but perhaps you should. It averages seven minutes in length. Never longer than ten minutes. I always answer a question asked by one of the JosephSangl.com readers. 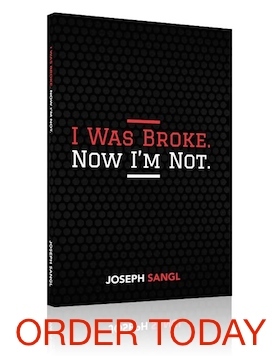 I always share a success story sent in by one of the JosephSangl.com readers. You might hear me yell, holler, and scream because I am so FIRED UP about what is happening through this crusade! To subscribe to the podcast via iTunes, click HERE. If you do not have iTunes, you can download a mp3 by clicking HERE. I could not get your podcast on my itunes, it says it is not available in US store. Can you help me? Joe… you gotta bring back the podcasts!! It’s also not available in Canada iTunes. How do I access your podcast?